It’s no secret that the world is on the brink of a significant paradigm shift. With the economy in shambles and the United States, Europe, China and Russia vying for hegemony over global affairs, it is only a matter of time before the powder keg goes critical. As was the case with World Wars I and II, the chess pieces are being positioned well in advance. It’s happening on all levels – monetary, financial, economic, geo-political. Lines are being drawn. Alliances are being cemented. We know that a widespread depression is sweeping across just about every nation on earth. The complete collapse of the world we have come to know as it relates to commerce and consumption is a foregone conclusion. We may not know exactly when or how the final nail is driven into the coffin, but we know it’s happening right before our eyes. Throughout history, when countries have fallen into destitution and despair, their leaders have often resolved their domestic plights by finding foreign scapegoats. This time will be no different – for all parties involved. In the following interview with Infowars’ Alex Jones, Joel Skousen of World Affairs Brief leaves nothing to the imagination and outlines what we can expect as East and West face off in coming years. The trigger is clear. 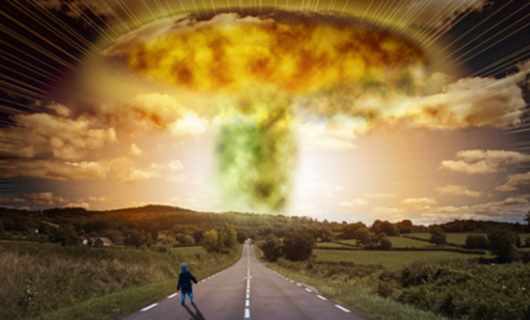 What will follow is nothing short of thermo-nuclear warfare on a massive scale. When you see a North Korean launch against the South… and they do some minor military attack every year, so you’ve got to be careful not to confuse those with a major artillery barrage on Seoul. If this ever starts you know you’re days away from nuclear war. People ought to get out of major cities that are major nuclear targets. There has to be a reason why North Korea has been preserved… It can only be because the globalists know that they are the puppets of China and that they will be the trigger. And if you ever see everything blackout, because both Russia and China will use a preemptive nuclear EMP strike to take down the grid… before the nukes actually fall… anytime you see all electricity out, no news, nothing at all… that’s the time you need to be getting out of cities before the panic hits. In his documentary Strategic Relocation, Skousen notes that the reason Russia and China have yet to take action is because they are not ready. But as current events suggest, they are making haste. Iran has apparently deployed warships near US borders and China has continually balked at internationally established air zones, encroaching on U.S. interests. North Korea continues to do whatever it wants, even after sanctions issued again their nuclear development plans by the United Nations. And, given President Obama’s refusal to attend the Olympic games with other world leaders that include Vladimir Putin and Chinese President Xi Jinping, it should be obvious that the relationship between the world’s super powers are strained. No one is willing to back down. And as we saw in the 20th century, that kind of diplomacy ends with the deaths of millions of people. No one believed it could happen in the early 1910′s and again in the late 1930′s. And with a Nobel Peace Prize winner at the helm of the freest nation on earth, not many Americans think it can happen in today’s modern and interconnected world. But what if history rhymes once again? Are we really to dismiss the warnings of Joel Skousen simply because it is such an outlier that it is impossible to imagine for most? Or do we look at history, see how such situations have unfolded over the last 5,000 years, and conclude that it is, in fact, possible that it happens again? The lives of hundreds of millions of people are in the balance. That’s a sobering thought for average people, but mere chess pieces to the elite who sit behind the curtains with their fingers on the buttons. As before, when the circumstances suit them and the time is right, they will invariably push those red buttons as their predecessors did before them. RELATED : FEMA Denies Camps Are Planned “Herding Points” For Proud Patriots. But Their Plan Is Actually Worse! Those in target cities in the U.S., Russia, China and Europe will become nothing more than statistics for the history books. But if you know the warning signs, then perhaps at the very least, you stand a chance. If you ever wake up one morning and your TV doesn’t work, the internet is down, and your cell phone is off, then you need to assume that your city or region was hit by a super EMP weapon, such as those being developed and tested in North Korea, Russia and China. As Skousen warns, in such a scenario you’ll have about two days to get out of major cities to a safe location outside of the blast radius. We recommend a number of resources, including Skousen’s Strategic Relocation and Holly Deyo’s Prudent Places, both of which outline safe areas in the United States based on various factors like population density, location of thoroughfares and resource availability. When it starts all avenues for obtaining critical supplies will be unavailable. Therefore, wherever you are, prepare for the worst by stockpiling reserve food and water. Given the scenario outlined by Skousen, nations may well engage in conventional warfare after the nukes drop, meaning that you’ll need to be prepared to adapt to changing circumstances and know, at the very least, basic military strategies and tactics to evade, defend and attack. It’s an outlier to be sure. But it’s one that has been experienced by every second or third generation on this planet since the dawn of human civilization. It may well be our turn very soon. Next PostIt Will Happen This Month, September 2015! Here’s Why Everyone Is Storing Food And Supplies!